So, you decided to travel in Istanbul. 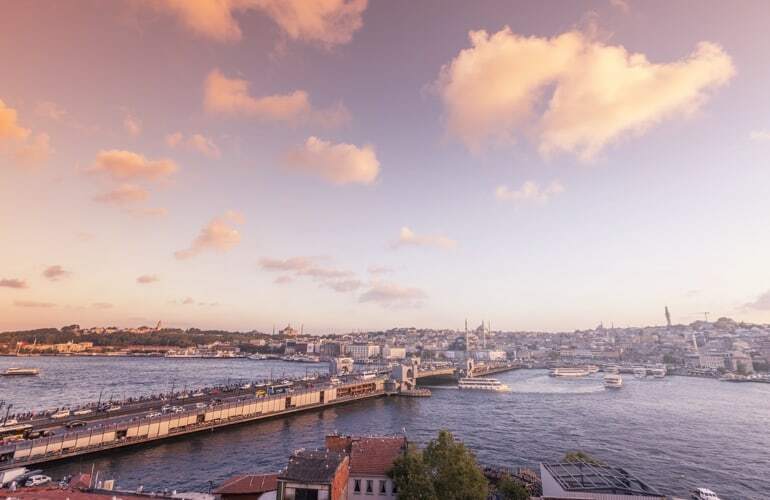 And this is understandable, because for sure its amazing Bosphorus sunsets, majestic mosques, warm-hearted people and, of course, delightful turkish cuisine will definitely make you fall in love with the city. Istanbul is huge and if you have no more than a week-end for your trip, you should organize it well. Then we propose you a plan which will allow you to discover the pearl of Bosphorus and see its main highlights in 2 days. 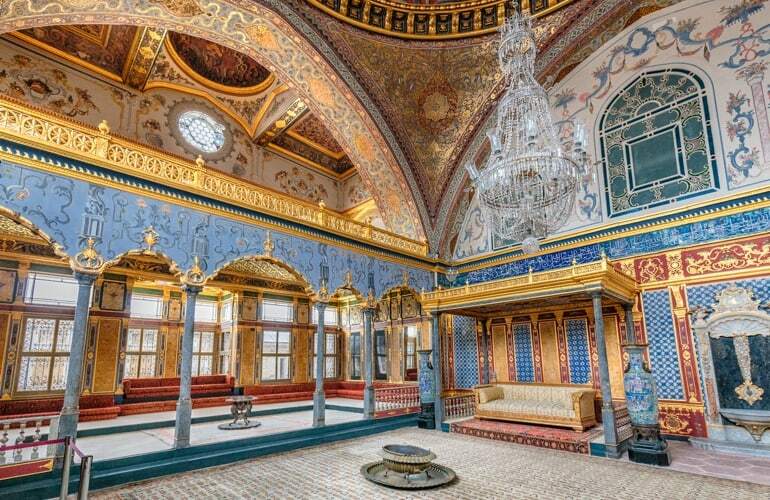 It’s a good idea to start your journey from the Topkapi Palace, which is one of the most visited places in Istanbul. However, if you come here in the morning, you will have all chances to avoid a long queue and enjoy the Palace without a crowd. Built in the 15th century, the Palace served as the main residence of the Ottoman sultans. Topkapi is huge and contains 4 main courtyards with hundreds of rooms and chambers, kitchens, beautiful gardens, baths of the Sultan, mosques, a hospital and Imperial Harem. Of course, not all the parts of the building are opened for visiting, but you will be able to see the main sites and plunge into the atmosphere of ancient times, when the Ottoman Empire was at the height of its power under the reign of Suleiman the Magnificent. One of the most interesting parts to visit is a Harem, which contains around 100 rooms and some of them are open for visitors. It was a place where wives of the sultan used to live with their children, servants and the rest of the family, including the sultan's mother, Valide Sultan. The museum is open every day except Tuesdays. You can count to spend around 3 hours there to see both the Palace and the Harem. Hagia Sophia or Ayasofia, the next point of your visit, is situated just 5 minutes walk from the Topkapi Palace. The building is one of the most impressive and greatest churches ever constructed. The legendary structure was built in 6th century and it was the world’s largest building of its time. This is interesting, that from its construction, it served as an Eastern Orthodox cathedral and was converted into an Ottoman mosque only in 1453. Today Hagia Sophia is a museum and definitely a must-see place in Istanbul, which attracts more than three million visitors annually. All the interior surfaces are made from a green, purple and white marble, artistically decorated with gold mosaics. 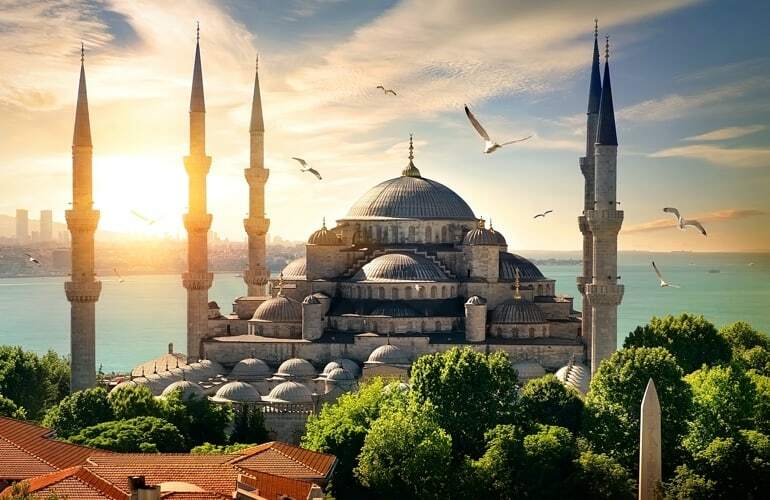 Magnificent columns, giant minarets, marble slabs, and world-famous mosaics make Hagia Sophia one of the greatest cathedrals ever built up to that time. It is open every day between 9am and 7pm except Monday. To discover more about Hagia Sophia check the Hagia Sophia Tours & Activities. It is unlikely that there is somebody in the world who didn’t hear about this iconic Istanbul place - the Blue Mosque. 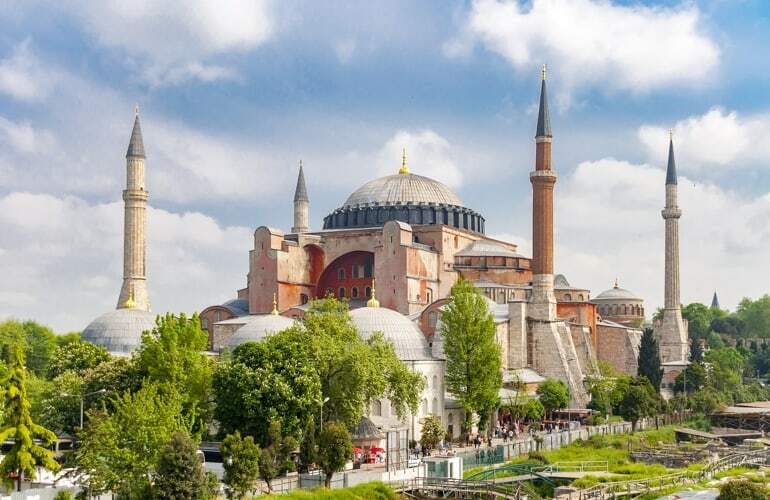 Constructed between 1609 and 1616 in front of the basilica Hagia Sophia, the mosque represents traditional Islamic architecture and a reassertion of the Ottoman power. The last great mosque of the classical period, it is framed by six minarets, accompanied by one large dome and eight smaller domes. This is interesting, because traditionally mosques have one, two or four minarets. That’s what makes the Sultan Ahmed Mosque unique, as only famous Harem Mosque in Mecca, which is considered to be the holiest place in the world, has six minarets. 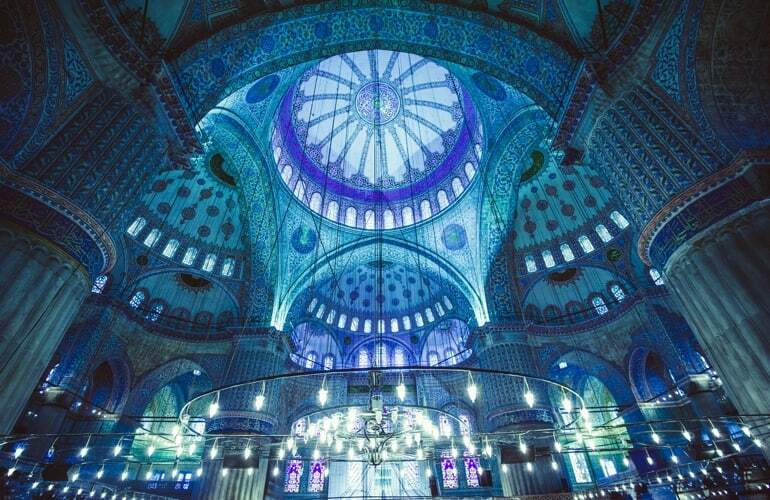 By the way, if you are wondering why the Blue Mosque is called like that, this is because of 20,000 hand-painted blue tiles which decorate its high ceiling and walls (look at the picture below). The mosque is opened every day of the year and closes only at prayer times for 90 minutes (muslims still may come in to pray). This subterranean cistern was built in the 6th century to provide a water filtration system for the Great Palace of Constantinople and other buildings on the First Hill. It is called Basilica because of its location under a large public square - the Stoa Basilica. The ceiling is supported by 336 columns each 9 meters high! The columns are the main feature of the cistern; each of them is made in different style and from different types of marble and stone. Indeed, this is a magic place worthy to visit. 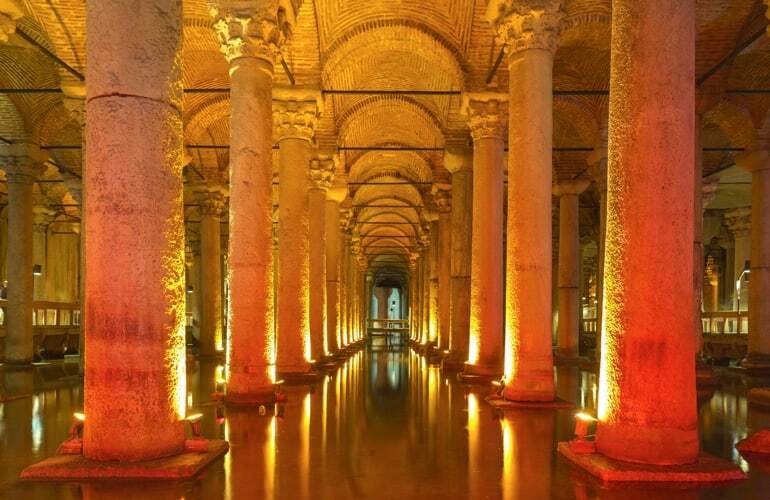 The Basilica Cistern is open every day from 9am to 7pm. 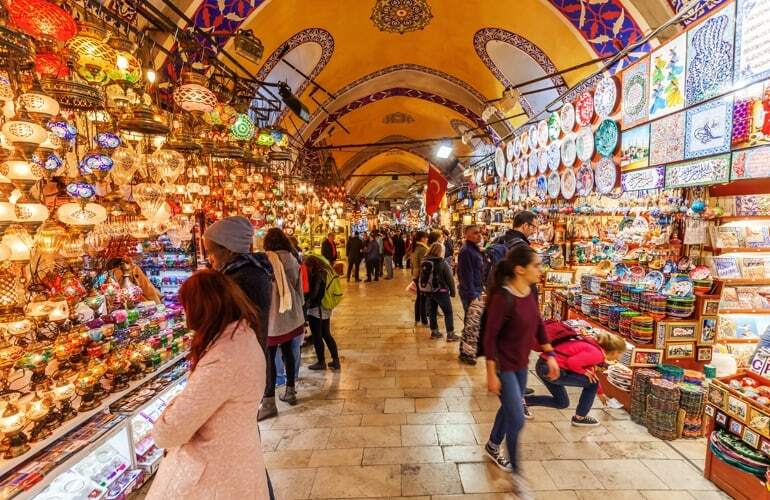 One of the largest and oldest covered markets in the world, Grand Bazaar is situated 20 minutes walk from the Basilica Cistern. It was built in 1456 and quickly became the trade center of the Ottoman Empire due to its prime location. It has 61 covered streets and around 4,000 shops with turkish goods on any taste. Thousands of jewellers, carpets, furniture, leather goods, objects of art and antiques will not leave anyone indifferent. But be careful, a bazaar crowded with people is an excellent field for pickpockets to do their job, so pay attention to your personal things. It is also important to remember that Turkey is a country of bargaining, so each price marked on the product may be reduced at least by half. Thus, if you found something that you really like, don’t be shy and knock off the price until both you and a seller are agreed on it. The Bazaar is open every day except Sundays from 8:30am to 7:30pm. This mosque is situated just in front of Bosphorus, so it will be a perfect point of departure for your second day itinerary. It was built between 1550 and 1557 by Süleyman I. 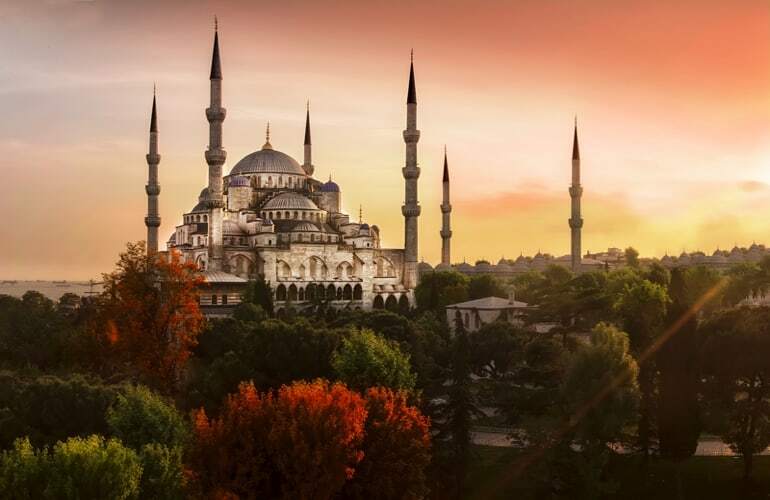 The mosque has 4 minarets and 10 balconies which symbolize the fact that Süleyman was the fourth of the Osmanlı sultans and the 10th sultan after the establishment of the empire. Inside of the mosque floors are covered with persimmon-coloured carpets and huge chandeliers provide the light together with 183 stained-glass windows. The Mosque is designed as a külliye, which is a complex of buildings including kitchens, bakery, turkish bath, a hospital, primary school and a public kitchen (imaret) which used to serve food to the poor. Today there are 5 bridges constructed over the Golden Horn. The first one was built during the reign of Justinian the Great in the 6th century. Few centuries later, in the years 1502–1503, Leonardo da Vinci created a project, which would have become the longest bridge in the world of that time. Nevertheless, the design was not approved by the Sultan Bayezid II. Michelangelo, was also invited to design a bridge for Istanbul, but he refused the proposal, so the project was not destined to become a reality. The first Galata Bridge was constructed in 1845 by Valide Sultan, it was made from wood and used for around 18 years. In general, there were 5 reconstructions of the bridge until December 1992, when the fifth and the last version of the bridge was completed. The Galata Bridge is a 490 meter long and its deck is 42 m wide. Today this is a favorite place of turkish fishers, which are standing there all day long with fishing rods and selling their catch. On the lower floor numerous fish restaurants and shops are situated. There are thousands of people at the same time on the bridge, enjoying the beauty of Bosphorus or just chilling and observing the fishing process. 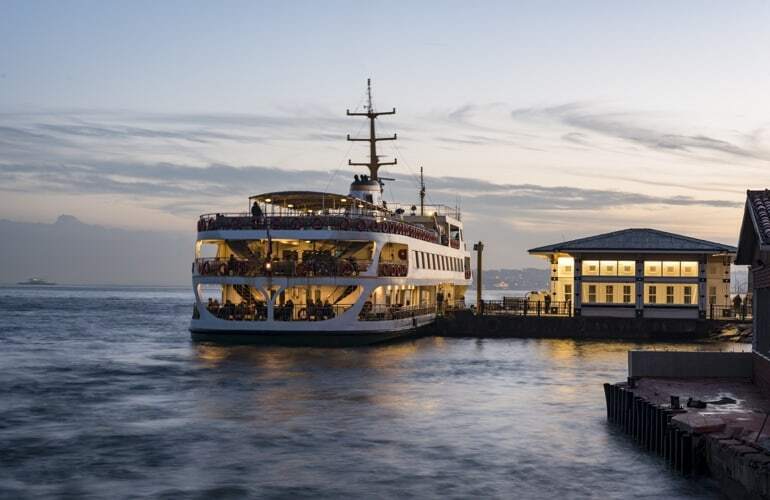 After exploring the most iconic bridge of Istanbul, join one of the boats from ferry terminals near the bridge and take a relaxing cruise on the Bosphorus. Taste at the same time delightful turkish dinner accompanied with a full program of entertainment, such as folk or belly dancing. The journey will last 3 hours 30 minutes and will serve as a wonderful ending of your day.